These knives are available in 35, and 45 degree angles. The optimal thickness range for cutting with these knives is between 30-150nm. 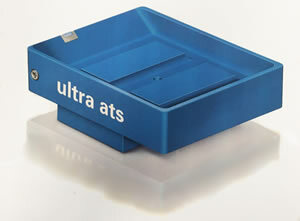 They are available in sizes ranging from 1.5mm-4.0mm as a standard. Other sizes are available upon request. All of these knives are tested within a thickness range of 30-150nm. Whether your needs are biological or materials related, in EM or LM, we have a knife to suit your needs. Recognized as the knife for routine sectioning. It is a good compromis between section quality and durability. In the meantime a great number of scientists have noticed and recognized the advantages of the 35° knives for the sectioning of Lowicryls, inhomogenous samples such as undecalcified bone, dental materials, etc. We can claim that the 35° diamond knife has proved it's capability as a routine knife for many applications. 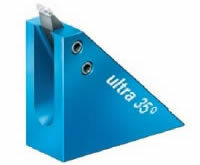 The ultra 35° knife (in the triangular holder) with a cutting range of 100nm - 2µm is used for dry sectioning of epoxy or acrylic resin embedded biological samples, which need to be investigated by element analysis (Ref. Edelmann) and SIMS (Ref. Guerquin-Kern). 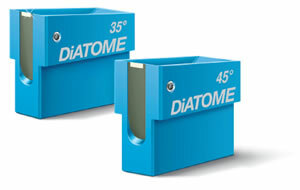 The gliding of the sections on the dry knife surface is facilitated with the use of our Static Line II ionizer. 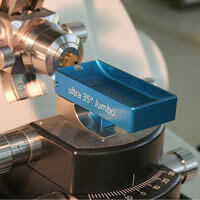 The Ultra Diamond knife is now available in Jumbo with 35° and 45° angles and in 2.0mm and 3.0mm sizes.